Many Internet searches today are followed up with a visit to a brick and mortar location. Local search engine optimization focuses on increasing your web visibility for those locally targeted searches, especially where mapping placements are shown alongside paid ads and natural search engine results. This type of page is now heavily promoted by Google in search results as of 2017. Additionally, there are other directory / review type websites out there today where customers can freely review your business. A Local Search Marketing Program will address where your website is listed and actively manage content of these listings so that your business is represented professionally across the web. 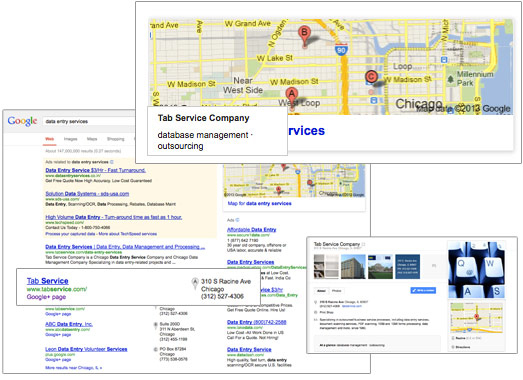 Google Plus / Places content has taken over the most important ‘above the fold’ screen real estate for many searches when a location term is combined with a search term or phrase, making it more important than ever to optimize your local directory results for Google. Bing is following a similar trend, as the key search engines take over the role as key, front line providers of local directory results. Thus it is more important than ever to pay attention to the local yellow pages role these engines now play in the business world. Regardless of the move toward AI in search, it is always smart to start your website or marketing efforts with keyword research, if only to figure out how the language your target audience uses relates back to what you are actually selling. Typically that is the goal of keyword research – the ‘mind match.’ It is a key form of consumer research. On an ongoing basis, Ceed will always recommend that your website traffic results are monitored and website pages are adjusted accordingly. This happens on an iterative basis until you are content with the level of sales your website property is helping to generate. In some cases, you may need to make consistent periodic efforts to maintain ranking and having access to intelligent multivariate website data will generally prove insightful into the best next move for SEO.